Extending water service to more local properties. 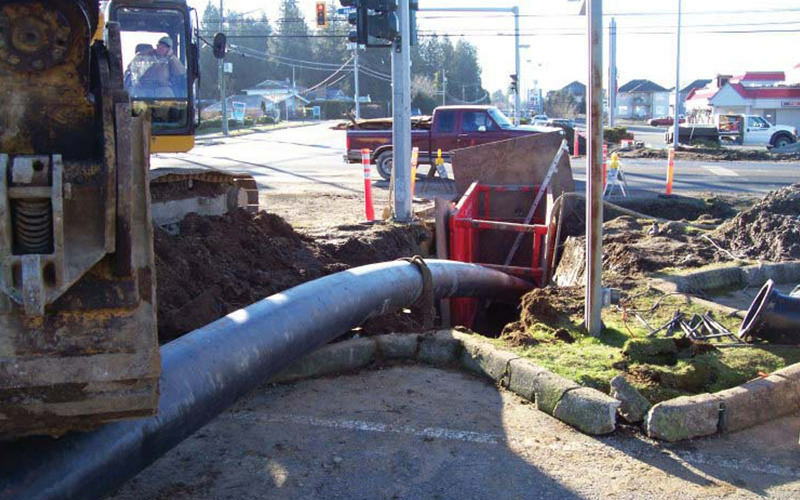 We were contracted by the City of Abbotsford to provide design and construction services for the extension of municipal watermain to service properties with individual water well supply in the West Abbotsford Area. We were responsible for liaising with existing property owners and City operations staff, preparing project display boards and presenting at public information meetings, preliminary and detailed design development, as well as administration of project tender, construction management and inspections. Upgrading of 200 Street from a two-lane (southbound) arterial roadway to a three-lane plus bicycle lane arterial road, complete with green-way path and street lighting; total length of 270m. Installation of approximately 130m of 300mm Ø watermain. Installation of approximately 1,870m of 250mm Ø watermain. Installation of approximately 3,640m of 200mm Ø watermain. Installation of two aerial creek crossings. Installation of new watermain through existing carrier pipe under Fraser HWY.